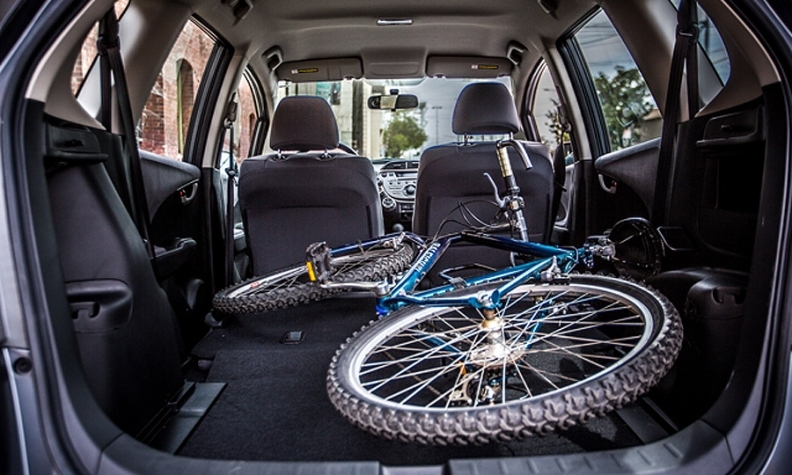 Honda's redesigned 2015 Fit -- room enough for a standard spare tire and a mountain bike. DETROIT -- The spare tire has been squeezed out of many new vehicles, thanks to run-flat tires, inflator kits, efforts to reduce vehicle weight and a lack of storage space -- especially in hybrids and electric vehicles. The problem is many drivers don’t know their spare isn’t there -- until they need it, according to a tow truck driver with whom I spoke. He says he is often sent to tow vehicles with flats -- and drivers often tell him they were never told that their new vehicles didn’t come with spare tires. Should new-car dealers require salespeople to inform their customers of the spare tire situation? But Phillips says the topic of the spare tire doesn’t often come up during purchases. The store, she says, usually orders all of its cars with the optional spare tire. Indeed, several Mustangs on the lot sported window stickers that listed the optional spare tire. Cost: $195. But generally, the spare tire is overlooked. Many buyers think it is standard equipment. “Our new 2014 Jeep Cherokee came without a spare of any kind -- not even a doughnut. There’s an air pump, but big whoop if you shred a tire,” says Maggie Erickson-Stiff, a retired newspaper editor who lives in Palm Bay, Fla.
“Count us among those who assumed. We were dumbfounded. We bit the bullet and bought a full-size rim and tire which, ironically, fits perfectly in the hole where the air pump was located,” she adds. The spare tire issue is big enough to catch the attention of AAA, formerly the American Automobile Association. A few years ago, AAA began compiling a yearly list of vehicles that no longer come with a standard spare tire -- and that includes the temporary minispare, or doughnut -- as well as the jack and the lug wrench. Spare tires have been standard equipment on most vehicles for more than a century. In the early days of the auto industry, many vehicles came with two full-size spare tires. According to the book, American Cars 1973-1980, space-saver or doughnut spare tires debuted in the mid-1970s as automakers sought to reduce weight and increase the trunk space available in downsized cars. Now, the minispare is giving way to run-flat tires, which can travel around 50 miles without air, or a tire inflator kit, which is useless when a tire’s sidewall is punctured. “We started to hear from motorists and road service providers that they were seeing an increasing number of cars without spare tires,” says Mike Calkins, AAA’s manager of technical services. “A lot of it was spurred by fuel economy regulations, so they [automakers] can save the 30 or 40 pounds of the jack and spare tire. That can knock a car down in an EPA category. Of course, it saves them money,” he adds. 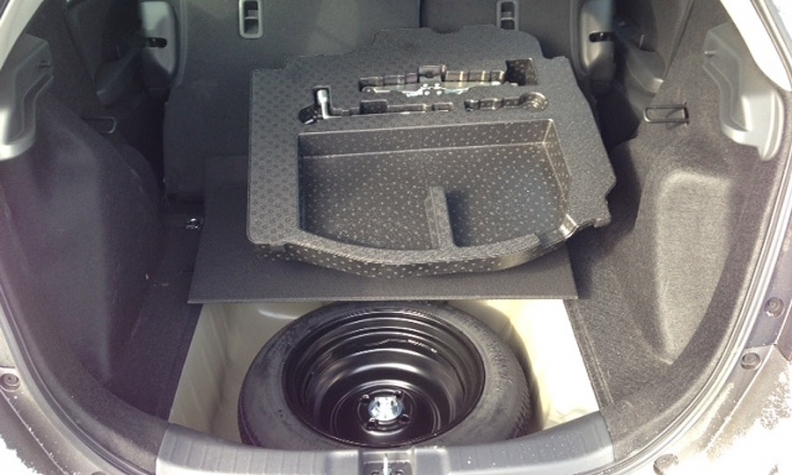 The 2015 Honda Fit: Room for a spare tire. That jibes with what Cadillac’s exterior design manager, Brian Smith, told me: “Spares are being removed for mass reduction and space efficiency. Why carry around a 40-pound wheel and tire that you may never use? In some cases, exotic, expensive materials have to be used in the structure or powertrain of the car to remove that kind of weight,” says Smith. He says today’s tires feature technologies that make them better able to withstand punctures, further reducing the need for spares. “Improvements in run-flat and self-sealing tires are also eliminating the need to carry a spare tire, minispare or full size,” Smith says. Richard Vaughn, a spokesman for supplier Visteon, points out that lugging around a spare tire that is likely to be used rarely wastes space and energy. “Let’s look at it from the other point of view, which is that it’s a waste of resources -- from raw materials to fuel used -- to carry around the extra 40 pounds for years, just in case you might need it once. It’s particularly wasteful when one considers that the average person is going to call for roadside assistance anyway,” Vaughn says. About the only vehicles that still have full-size spares are most pickups and large SUVs. But AAA says drivers are griping so much about the lack of a spare that automakers are starting to return some type of spare to vehicles. Honda has equipped all variants of the redesigned 2015 Fit with a spare tire after dropping the feature on the previous model.